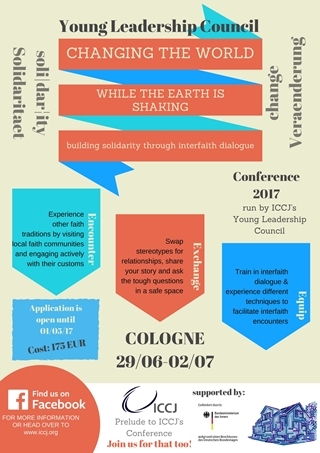 Each year, the Young Leadership Council, or the YLC, hosts an international, interreligious conference. Held in a different city around the world every year, our conference brings together a group of carefully selected participants from diverse religions, backgrounds, and geographical locations. Our theme this year is “Changing the World while the Earth is Shaking: Building Solidarity through Interfaith Dialogue.” Within this theme, we will examine the relationship of our faith traditions with current earth shaking events: social changes, such as Brexit and the US election, and tragic realities, such as the largest refugee crisis since World War II. At the same time, on this 500th anniversary of the Protestant Reformation, we will compare the present tumult in our world with the tectonic circumstances of the sixteenth century, while acknowledging the history of violence against religious diversity. We will examine how not to be overcome by prejudice and fear toward the religious Other, and we will explore how faith traditions can be sources of positive change in a turbulent world. We will equip ourselves to be proactive and build bridges through interfaith dialogue in our own lives and worlds today. We seek participants who are eager to build a global community of young people excited to engage in interreligious dialogue, to encounter new people and experiences, and to bring what they have learned back to their home communities. Diversity is key to the success of the YLC. We seek participants from a multitude of religious backgrounds representing Jewish, Christian, and Muslim traditions. We experience Muslim, Jewish, and Christian services as a group, and we make every effort to honour how each participant observes their religious services from the beginning to the end of their stay. All food is vegetarian, and every effort is made to honour whatever Kosher, Halal, and other dietary needs participants have. We recognize that religion has far-reaching implications, particularly in tense political situations, but our principal objective is interfaith dialogue, not political affairs. While we appreciate how interconnected politics and religion can be, we ask all potential participants to agree in advance to put people, specifically each other, over politics. As well, we work to be a truly international conference. In the past, we have had participants travel from diverse regions of the world, from the Middle East, North Africa, Europe, and across the Americas. This year, we hope you will join us too! If you have any questions, please email the Core Team at ylcboard@gmail.com. The 2017 YLC conference will begin on Thursday afternoon and conclude on Sunday afternoon. Being available for the entire conference is important, so we recommend arriving Thursday morning. This year, the YLC conference will take place in Köln, Germany. We have booked accommodation in a hostel, and we will have meeting space and kitchen facilities nearby. We will also be travelling around the area to visit local religious communities and organisations. More information about our partners will follow soon. Feel free to email ylcboard@gmail.com with any questions in the meantime! 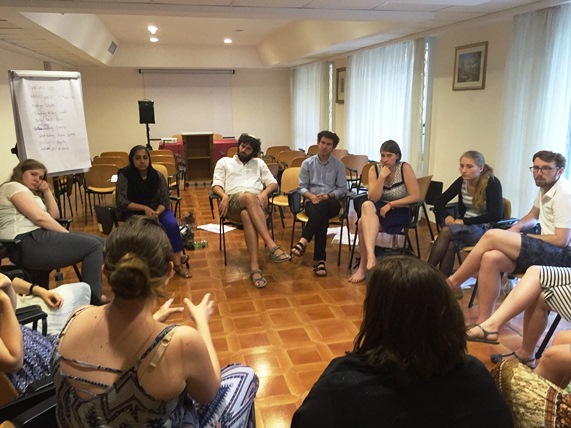 Drawing young people together to learn more about diverse faith traditions within Judaism, Christianity, and Islam, our annual conference seeks to share skills for interfaith dialogue across the world. The primary aim of our conference is for diverse young people to meet each other, to share their perspectives and experiences, and to learn from and about one another. These goals are especially important in the tumult of today’s world, when interfaith dialogue and bridge building are needed even more. We support these objectives through programming that includes workshops and creative activities, shared prayer times and services, visits to local faith communities, and interaction with sacred texts. We hope each conference inspires participants to take their skills and experiences back to their home communities. Participants should leave the conference feeling encouraged, inspired, and equipped to engage their own communities in positive, meaningful dialogue. Just fill out our application form, and a team member will respond to you as soon as possible. The program fee is €175, which includes meals, travel to and from partner activities, and accommodation. Maybe you know someone else who needs to know about us? Please share our information widely!